Desert wildflowers were blooming and the sun was shining, so even wild horses could not keep us away while record-breaking high temperatures were rolling across San Diego County. It took longer each day for the sun to dip below the nearby mountain range and bring comforting shade and refreshing coolness to our Safari and us. 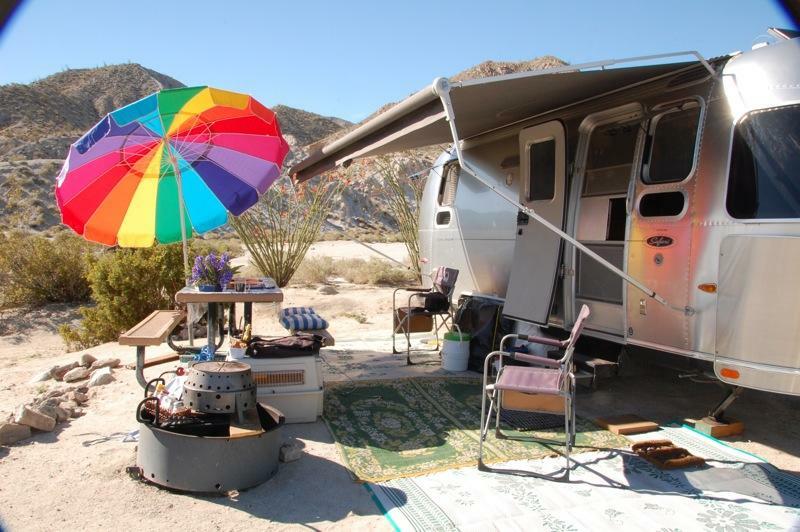 During the week temperatures progressed from the high seventies to the high nineties in the Anza-Borrego Desert. 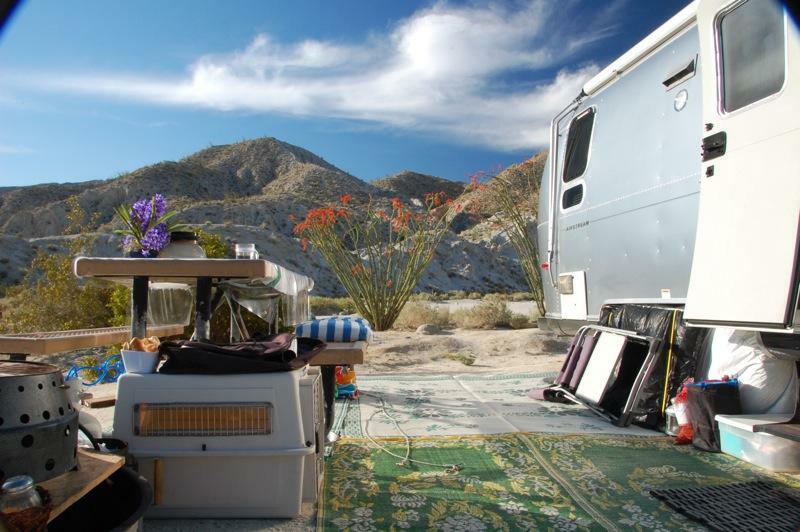 Areas of the Anza-Borrego Desert were once part of the ancestral Gulf of California and are rich in fossils, such as horse teeth. According to Wikipedia, the horse is native to North America and Equidae fossils date back to the Eocene period, 54 million years ago. 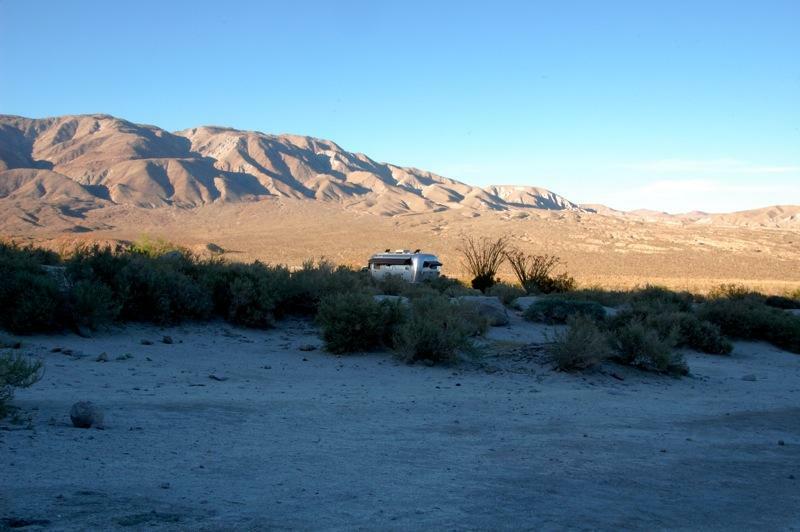 Equus fossils, such as those thought to be Equus scotti, have been found in the Anza-Borrego Desert. All Equidae in North America became extinct about 12,000 years ago, but horses eventually returned to the Americas with Christopher Columbus in 1493 (second voyage). Some horses escaped and formed feral herds, such as the Mustang. In 2003, the last herd of wild horses in Southern California was removed from Anza-Borrego’s Coyote Canyon, but efforts are underway to restore the herd amidst much controversy. We recently acquired this beautiful fused glass art, “Galloping Horses”, by Lyn Feudner, from The Art Glass Guild, part of Spanish Village Art Center, next to the San Diego Zoo. A closeup of this piece is seen in Lyn’s blog posting, “Fused Glass Horse“, and is based on her sketches posted last May. It goes well in front of our Vista View window. Here is what is also new in our trailer. 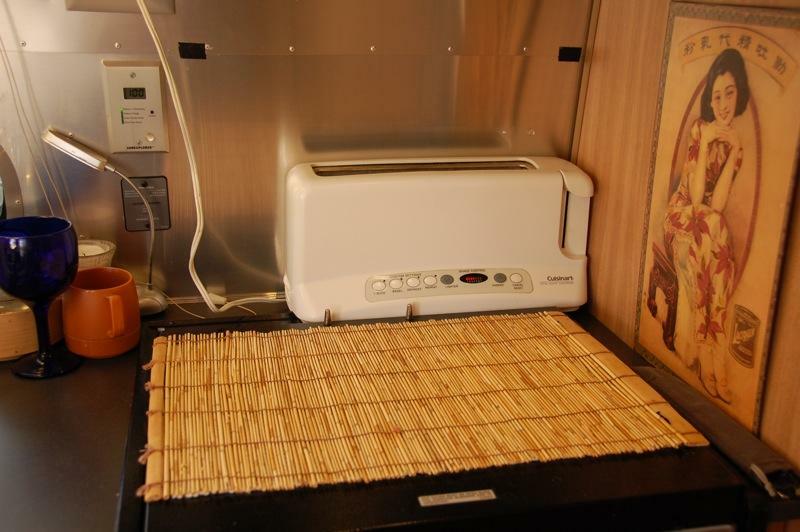 We found that the Cuisinart CPT-60 2-slice toaster with its wide long slot is perfect for toasting slices of Larry’s homemade artisan bread rounds and fits perfectly in back of the stove when not in use. It is pulled out onto the mat under the stove hood when in use (unfortunately it is currently unavailable). 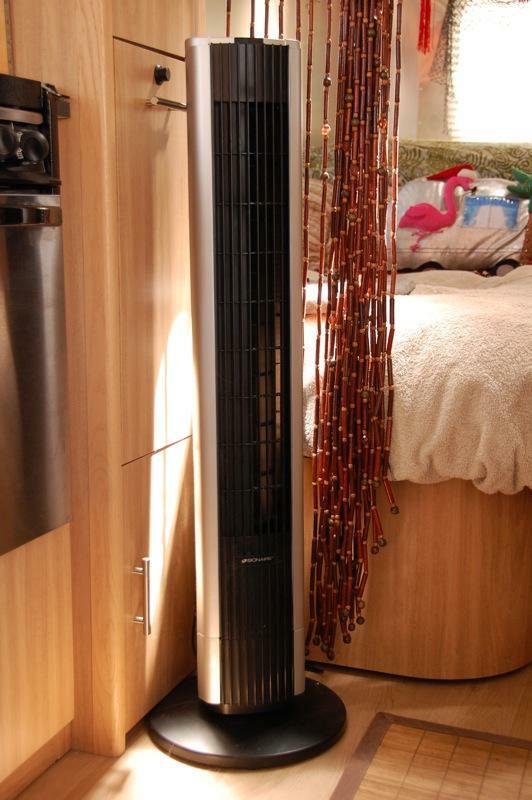 This 39″ high Bionaire Tower Fan from Costco has a small footprint and yet produces a cooling breeze inside the trailer when it is not quite hot enough to close up the trailer and start up the noisy air conditioner. 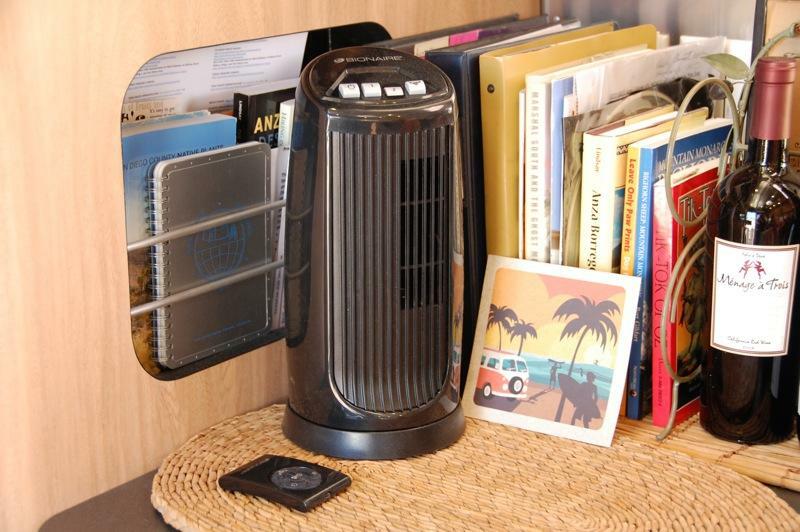 It is remote controlled and comes with a 12″ high Mini Tower Fan. where wild horses couldn’t keep us away. Desert blooms are not as profuse in some places of the Anza-Borrego Desert this spring due to three straight nights of freezing temperatures in February, but magnificent points of color can still be treasured. 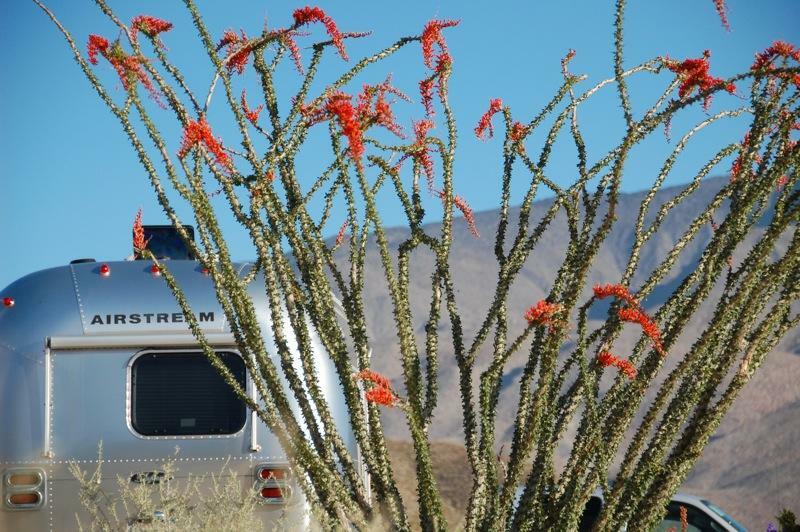 Avoiding nails, I carefully backed our Airstream Safari into our Agua Caliente County Park campsite, right up to two spectacular ocotillo plants lush with small green leaves and profuse crimson flowers. Every morning we opened our door to wonderful displays of color. 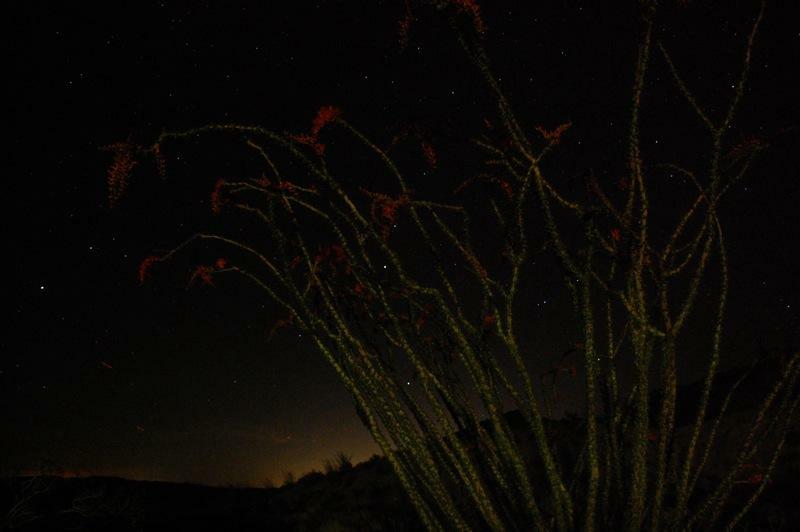 Nearby our two ocotillo plants is a creosote bush in full bloom. 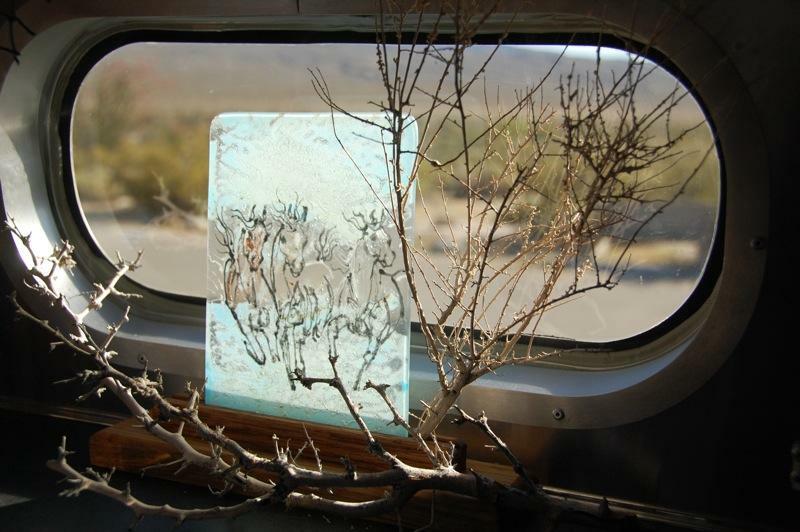 The Creosote bush, Larrea tridentata, is an evergreen shrub with dark green leaves and yellow flowers. According to Wikipedia, this plant was used by Native Americans in the Southwest as a treatment for a variety of illnesses and it is still used as a medicine in Mexico (the species is named after J.A. Hernandez de Larrea, a Spanish clergyman). 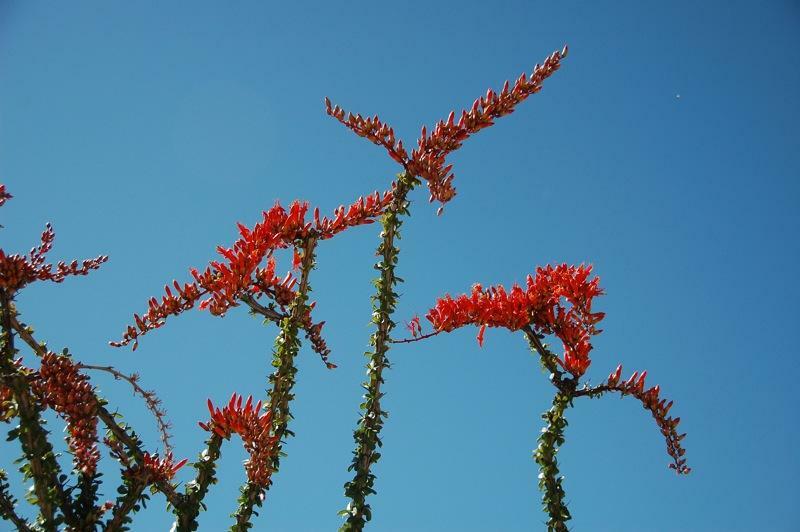 Another medicinal, the ocotillo, Fouquieria splendens, has bright crimson flowers that often appear after a rainfall. According to Wikipedia, the fresh flowers are used in salads and the dried flowers are used for herbal tea. All the desert is awake and rejoicing in Spring. Fountains of wax-like white flowers tower above the green, bristling bayonets of the yuccas and the emerald wands of the newly-leafed ocotillos are tipped with points of flame. Color! Sharp, vivid color! That is the keynote of the wasteland’s awakening. And the knowledge that the vanished Children of the Desert found in many of these gorgeous blossoms a source of nourishing food takes nothing from their charm. Both the flowers of the yucca and the ocotillo are good to eat. After a cold, rainy winter, my spirits rose while hiking the Moonlight Canyon Trail in full sunlight and rising temperatures. 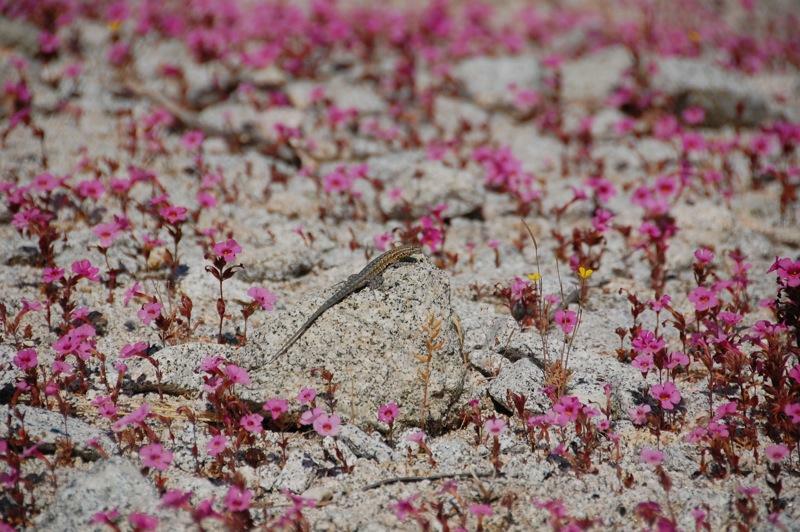 I spotted a lizard basking on granite surrounded by a sea of Bigelow Monkeyflowers, Mimulus bigelovii. Barbed cholla spines pierced my lower pant leg and shoes as I maneuvered to take the photo of the barrel cactus below. 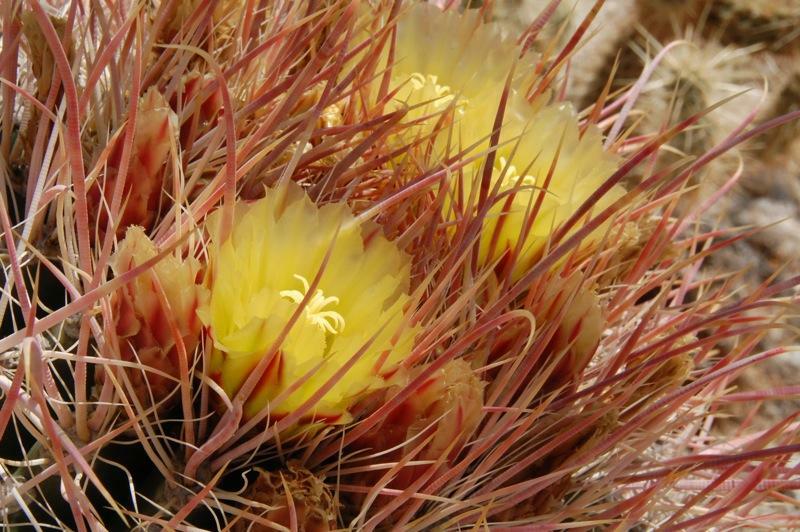 I returned to camp, removed the cholla spines, and enjoyed my daily noontime shower followed by savoring a cotto salami sandwich made by Larry. 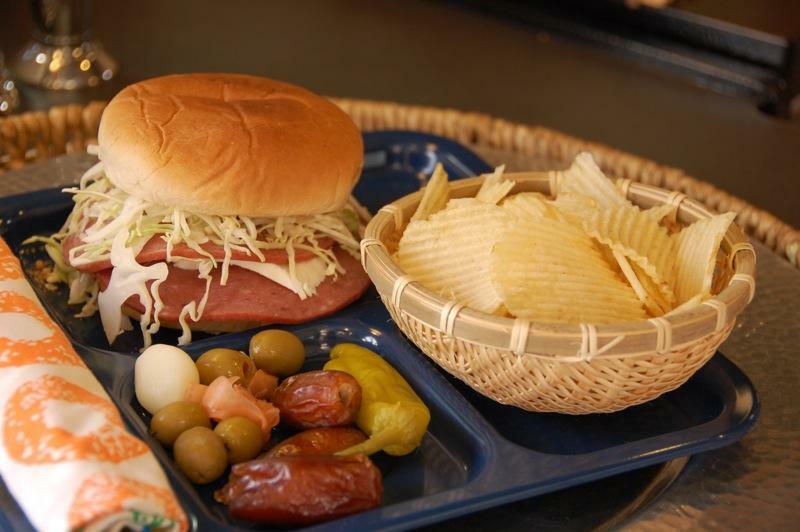 Slices of cotto salami are placed in a toasted bun with finely shredded cabbage, horseradish mustard, mayonnaise, cream cheese, and onion with a side of chips and pepperoncini, Asian pickled garlic & ginger, olives and Deglet Noor dates. This was complimented by a cold bottle of Heineken. Then came afternoon reading, writing, walking the dogs and dining and photographing under the stars… and listening to a French song. I carefully backed the trailer into the site, unhitched and set up camp. I have written about the importance of having TPMS, Tire Pressure Monitoring System, and recently, why I have two TPMS systems. Another benefit of having TPMS is that tire pressures can be quickly and easily checked even though the tires are covered and have folding chairs and coolers in front of them. It is reassuring to check the tires a day or two after pulling in to make sure they are maintaining the proper pressure. I could also see how the pressure fluctuated depending on the air temperature. Here in the desert the tire pressures increased 2-3 pounds per square inch from morning to noon. 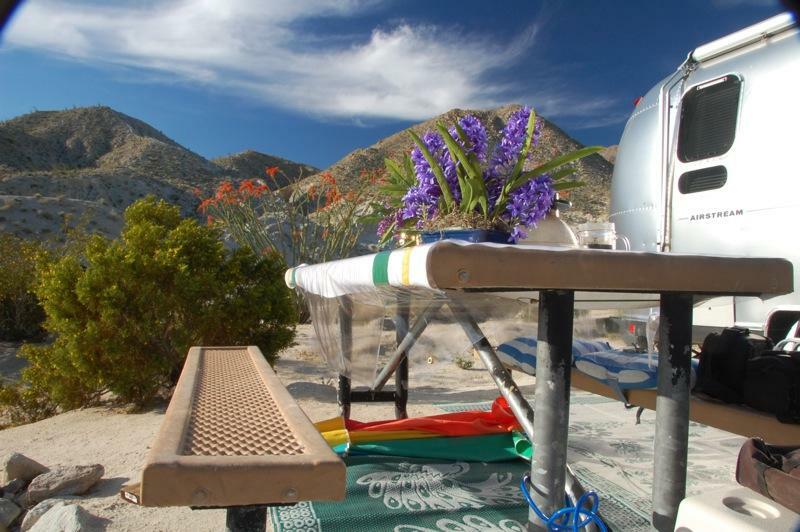 This week at Agua Caliente County Park the wildflowers were blooming and the nails were proliferating, especially in our fire ring. Nails! 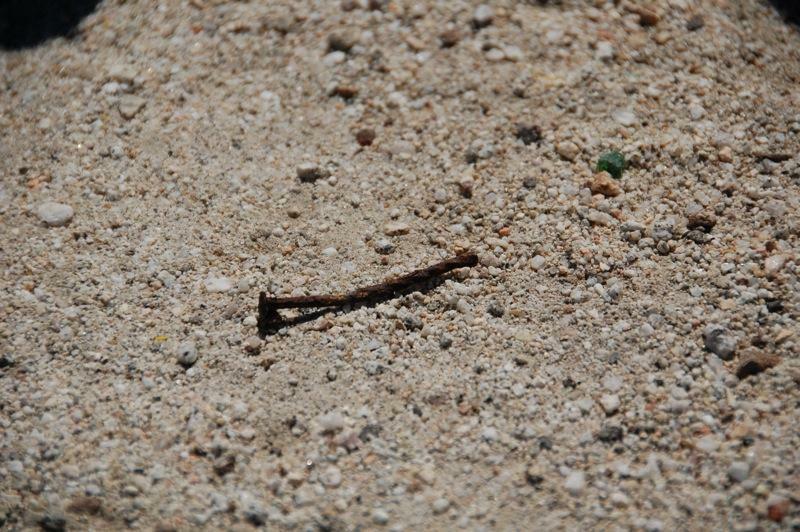 So that’s why there are so many nails and screws at campsites. Campers bring in lumber with nails and screws and use it as firewood! And as this lumber is cut or broken to fit the fire ring, nails and screws are set adrift. 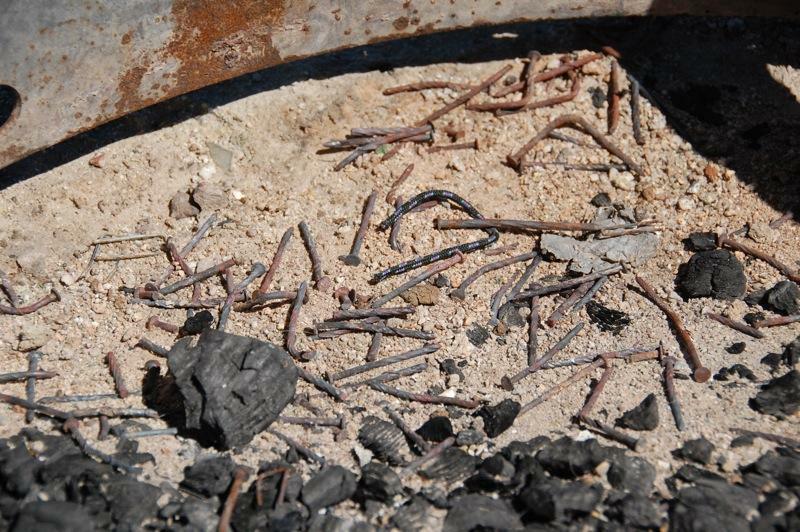 Those nails and screws that make it into the fire ring don’t always stay there. 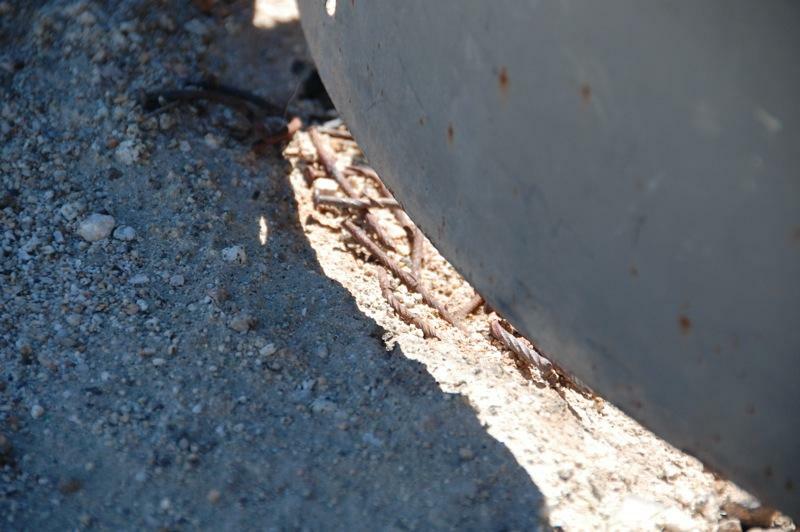 The base of our ring did not make continuous contact with the ground and I could see nails escaping, some seemed to be actively crawling toward our truck’s bare tires! 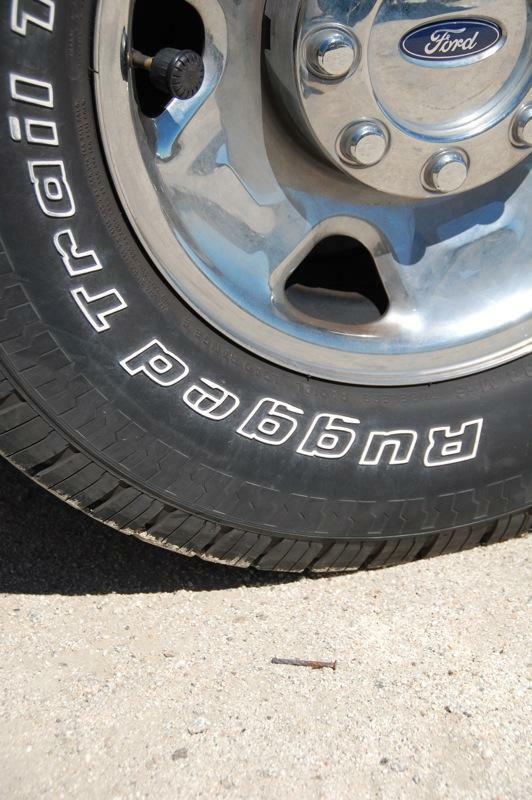 One nail came close… and met its master… the heavy duty tire equipped with TPMS.